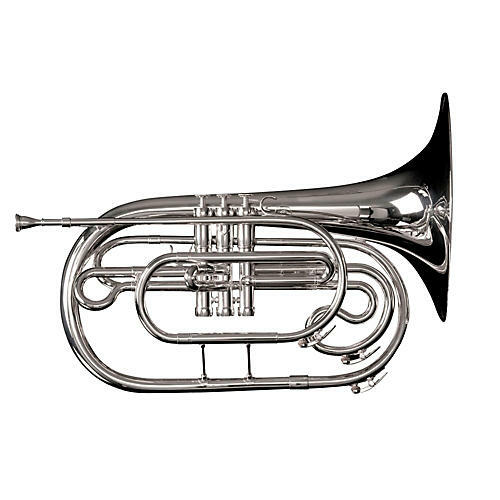 The Adams MF1 is a front-facing French horn for marching. It is a Bb instrument with a .470" bore, an 11" bell, and stainless steel pistons. It weighs a mere 3.9lb and comes with a case. Only the highest quality materials have been used in the creation of these well balanced and lightweight horns, resulting in a product line that players and directors agree has the greatest sound quality on the field. Proprietary valves are produced with precision cut stainless steel pistons for quick response and years of maintenance free playing. All Adams Marching Brass Lacquer and Silver option instruments are handcrafted in Thorn, Holland.